Lahore being the provincial capital and the cultural heart of Pakistan has always remained in limelight due to various activities. Whether we talk about excursion around the walled city of Lahore or take an insight into the urban Lahore, we are sure to find endless entertainment opportunities that would leave us mesmerized. The awe-inspiring traditional and historical culture of Lahore to its extravagant urban areas, where five star hotels, exhibition centers, state of the art cinemas, restaurants and a lot more can be experienced while being in this amazing city. A new trend that caught the attention of the locals and the media lately, is of the rooftop restaurants in the city. When the scorching heat of the city reaches certain level, there cannot be a better idea to cool down your body than visiting a rooftop restaurant in the evening and enjoying delicious food with city’s special deserts. This excitement doesn’t go-slow in winters, as foodies from all corners of Lahore take their loved ones and friends to the best rooftop restaurants in the town and relish freshly cooked food and hot drinks. It all began from the walled city of Lahore with the opening of restaurants like Cuckoo’s Den, Andaaz and Haveli. 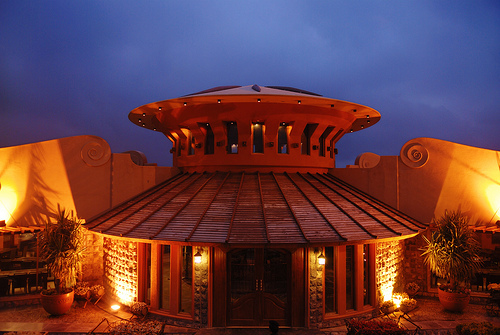 These restaurants not only introduced the trend of rooftop dining in Pakistan’s cultural heart, but also hired the services of best interior designers in Pakistan such as AmerAdnan in order to make sure that the city’s unique and highly inspiring cultural architecture never dims out. The stunning views of Badshahi Mosque and Lahore Fort can also be enjoyed along with the extensive variety of desi and western food. As these restaurants received a warm welcome from Lahorites, it gave other restaurant owners enough confidence to introduce rooftop dining. The Lahore Development Authority (LDA) has also appreciated this trend and has auctioned tenancy rights to The Monal Restaurant, a popular open air eatery on Margala Hills Islamabad, to open a branch in Lahore’s Park N Ride Plaza, in Liberty Market. This restaurant is located on the tenth floor of the building that is the rooftop of Park N Ride Plaza and covers an area of 9000 square feet. The bids for a rooftop restaurant started at Rs.60 per square feet and ended up with Monal Restaurant winning it for Rs.146 per square feet. This rooftop has therefore been leased for Rs.15.76 million per annum. The restaurant offers a breathtaking view of the metropolitan city. This recent opening of Monal Restaurant in Lahore has further boosted up the trend of rooftop dining in the city and many more are expected to open in the near future. If you are in search of fine rooftop restaurant in Lahore, apart from the ones mentioned above, there are many like Bistro 201, Dine Out, Banera Rooftop Restaurant, Heights n Delights, Maisonnette and many more. The best time to visit a rooftop restaurant in Lahore is right before the sunset, as it will give you an opportunity to enjoy the magical color range of the setting sun in Lahore’s awe-inspiring skyline.